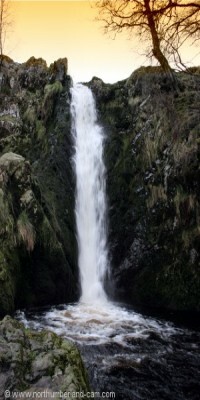 This walk of just over 3 miles from Hartside to Linhope Spout is very popular. 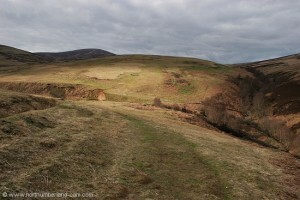 It is also the start and finish section of other walks into the Cheviots, in particular Hedgehope Hill. 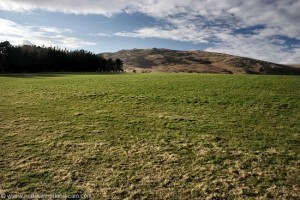 Hartside is reached via Ingram Valley, a very popular picnic spot. Parking - we parked on the grass verge before the farm, but care is needed as it can be soft. Toilets - Ingram Visitor Centre. 1) From where we parked we followed the road past Hartside Farm with views to Shill Moor ahead, Dunmoor Hill on our right. 2) We soon passed a wood on our right where the road starts to go downhill. In the spring rhododendrons flower along the roadside. 3) At the bottom of the hill is Linhope, where we followed the road past the houses and turned left. 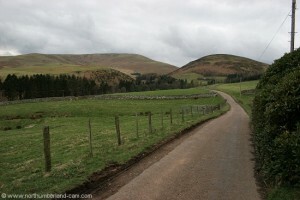 4) The road then rises and the footpath to Linhope Spout lies ahead and to the right. (The road to the left is private). 5) We followed the path as it rises through some pasture land on the lower slopes of Ritto Hill before reaching a kissing gate at the edge of a forest. 6) This path skirted the edge of forest and rises until open views of Great Standrop and Hedgehope came into view ahead. 7) At the corner of the forest we passed through another kissing gate and followed the path across some open moorland. 8) A path to the right, easily visible, zig-zags down to Linhope Burn and after a short distance Linhope Spout waterfall. 9) We returned via the same route with good views ahead all the way back. - Map - Ordnance Survey Landranger sheet 81, Alnwick, Morpeth and surrounding areas. View towards Linhope and beyond to Shill Moor. 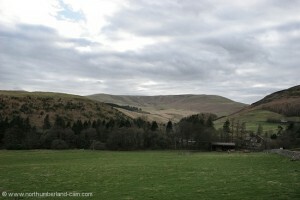 View of Linhope Burn - in the distance - Hedgehope Hill.